Whether you've decided to keep it simple with a pair of Studs or looking for classic Indian Jhumkas , Saharas & Chand Balis, or wish to make a classy statment with a pair of Chandelier earrings, we have all types of Indian earrings to suit your needs. Shop with FREE UK, USA & Worldwide Delivery. 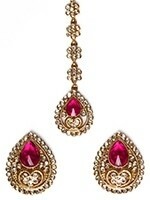 Buy beautiful Indian Earrings from Indian Jewellery Store. 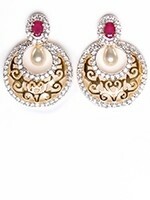 Chandellier - Long earrings which hand/ dangle down. These generally sway as the wearer moves creating a elegant flowey effect. 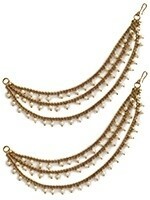 Show off your neck and bare your shoulders when you wear these for a dramatic effect. In our chandellier earring collection you will find a good mix of tradional and Western style earings. 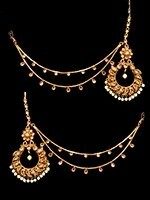 Chand Bali - These are crescent shaped traditional Asian earrings. They come generally in medium to large size. 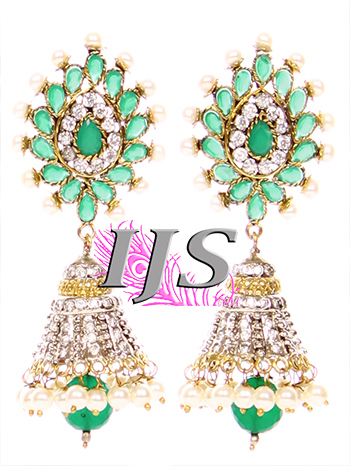 Jhumki / Jhumka - these are also traditional in style, originating from the Indian & Pakistani reigons of Punjab. 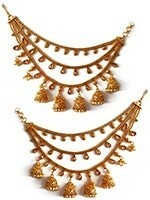 Jhumkas feature a hanging dome or bell shape. Jhumkis can come in any size and can also be layered with several domes on each earring to acieve al semi-dangler earring effect. Sahara Earrings - Traditional Asian Indian earrings which have chains which you can drape either over the ear or into you hair. 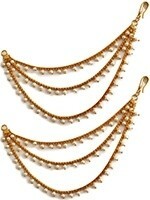 Studs - Indian stud earrings tend to be larger than the Western interpretation but otherwise the definition is the same. Obviously our studs tend to be more ornate than Western styles.